Druids and Mayans used sundials to track the seasons. 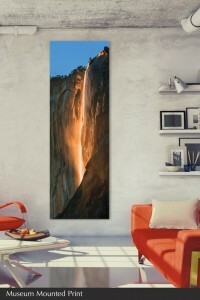 The annual, but brief, convergence of sun and waterfall in Yosemite offers another telltale sign which resembles magma spouting from a volcano; in fact, the natural spectacle of light that occurs at Horsetail Fall has been described as pure visual alchemy and coveted to have as a photograph. Thomas D. Mangelsen was there to document it as the arcing rays of the setting sun fall perfectly upon the tumbling cataract of water, making it glow like lava.